Lego bricks have been appearing in videogame form for decades, but despite the prolific volume of movie-licensed Lego sets, games have had little opportunity to get turned into packaged construction sets. We finally got Overwatch Lego sets last year, and – incredibly – we can buy Homeworld sets, too. While these ship designs are officially licensed, they’re not produced by Lego. Instead, they come courtesy of a company called Brick Formation, which specialises in producing “IP licensed kits made from genuine Lego elements” – a fancy way of saying this company will take on projects Lego itself will not. While there are plenty more sets planned, the initial line-up includes three Hiigaran vessels, and as Kotaku notes, they are all incredibly expensive. 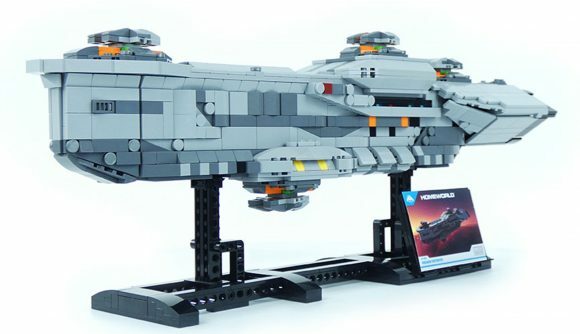 The smallest set, the Interceptor, consists of 500 pieces and is $250. The Ion Cannon Frigate has 705 pieces for $300, and the lineup tops out with the Destroyer at 1365 pieces for $575 pieces. I’ve been out of the Lego scene for a long time, but the last I recall a 500 piece set should be around $50. I guess you’ve got to pay a markup for custom engineering. Check out some Rainbow Six Siege Lego while you’re here. Even if you’re not intent on buying expensive new sets, there are plenty of fan-made creations that you can enjoy looking at for free.